Sonny Curtis wrote "I Fought The Law," "Walk Right Back," and the theme from the Mary Tyler Moore show. I picked the Tuesday Wall Street Journal off of the coffee table today and read with interest that some women with lower-back tattoos are concerned about the safety of getting an epidural during labor and having the anesthesiologist poke the needle through their tattoos. The article said that nearly 25% of women ages 18-50 have tattoos, of which nearly 20% are of the lower-back variety. And apparently 65% of the four million births per year in the US involve epidurals. Now, one easy way around this is not to have an epidural. Not to brag--and I am well aware that many people think this indicates stupidity or insanity on my part, so don't worry about the old ego too much--but I made it through an intervention-rich, pitocin-assisted 27 hour labor with 4 hours of pushing and no epidural. An even easier solution: don't get a tattoo! On those occasions when you just cannot let life go by without ornamenting your body, consider henna. Or how about Sharpies? They come in so many pretty colors these days. I removed seven no-longer-functional cords and cables, four speakers, and a sub-woofer from the sun room, and swept up some museum-quality dust bunnies. In the process I managed to mess up the new computer! I attended Back-to-School Night two nights in a row, including the new (to me) and grueling "follow your middle-school student's Tuesday schedule" program. Okay, maybe not grueling. I revised Chapter One of my book for the third or fourth time. Please tell me that getting the first chapter perfect will be the key to the rest of the book. With regard to the student tasered at the Kerry speech in Florida: I would never condone the use of the taser in that situation and setting. I don't know enough about tasers to say whether I think their use is ever justified. I hate the idea of causing people pain. But when I tried to watch the incident on YouTube, I wanted to taser that guy in under 60 seconds, long before security even started to approach him. I'm just saying. Also, Fall Fundraiser for the kids' school kicked off on Monday. Here is one of the items they are supposed to try to sell. Mickey is not wearing those folded glasses. 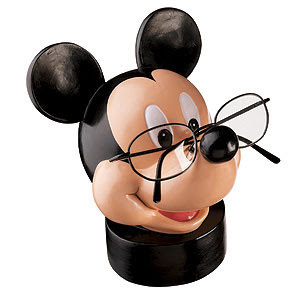 No, this is a Mickey-shaped stand built for the express purpose of storing your glasses. I think constantly losing them would actually be preferable to making house room for a large Mickey head, how about you? At the grocery store today this product happened to catch my eye. The link mentions that you need a medium onion to complete the onion soup project, but I couldn't resist picking up the box, which also specifies 8 cups of water. What's inside the box? Authentically French-tasting chemical powder, presumably. The fact that the box was on the "50% off why did we ever carry this item?" rack restored my faith in human nature somewhat. M.'s homework on Tuesday was a picture of children playing on a playground; she was supposed to color in the children who were breaking playground rules. She colored in quite a few obvious malefactors, such as a boy standing on the slide. Today the worksheet came home "corrected," with several additional children circled. Apparently virtually everyone depicted on the playground was misbehaving, including a girl who was hanging upside down by her knees from the jungle gym. Now, I was never brave enough to perform this feat myself; but I always thought that was just the sort of thing one was expected to do on the jungle gym. That's M.'s lunchbox. R.'s has all blue containers, and S.'s has more muted primary colors. You can buy one at Laptop Lunches, and I found out about them at Vegan Lunch Box. If you are a faithful reader, you have already heard more than you want to about our lunch boxes. Clockwise from top left: leftover crispy shrimp from Martha Stewart Everyday Food, made crispy in the oven with panko. Panko, where have you been all my life? All those wasted years (two) as I walked through the bulk aisle at Whole Foods, idly wondering, "What's panko?" And even after I knew--some kind of Japanese bread crumbs--I didn't understand what kind of magic you would bring me. Let's see, where was I? Cut up strawberries. Dried apricots and Laughing Cow cheese. Green beans and grape tomatoes with a tiny container of hummus. Yummus, as the Cowardly Lion might say. I am a real runner now. I just ran in the rain. A soft, drizzly-to-light range rain, but rain nonetheless. It was actually quite refreshing. I'll be darned: the conventional wisdom turned out to be right again. I also did some rudimentary speedwork, which I think was awfully brave of me because I don't like the part of running that hurts, and I put a lot of effort into getting in good enough shape to run without pain in my carefully chosen comfort zone. But I also saw the looks on well-meaning seasoned runners' faces last fall when I told them my 5K time. Not to mention the fact that the conventional wisdom says having a goal reduces boredom. I ran with my tiny junky giveaway radio because my Dell DJ has given up the ghost. WBJB was playing the transcendent "New York City Serenade. "* What happened to my Bruce Springsteen, the 1970s Dylanesque Springsteen? Is there any way we can get him back? Madeleine L'Engle is the only author I have ever written to. I had read most of her young adult fiction before I got to college, but I discovered her adult fiction in my college library, and I wrote to thank her for The Small Rain, which I found so moving that I had to take regular breaks for walks while reading it. She wrote back the most marvelous thing: "Thank you for caring about Katherine." I try to make my titles allusive, but so gently allusive as to be merely nagging. For example, "Golden Years" was meant to stick David Bowie's 1975 song of that name in your head, if it could be stuck. And...scanning May, June, July and August, no other real examples. At any rate, the above title gently alludes to Edna St. Vincent Millay's 1940 poem, "There Are No Islands, Any More: Lines Written in Passion and in Deep Concern for England, France and My Own Country." Vigorous Internet searches (vigorous considering that I am ever-so-slightly hung over) seem to demonstrate that Millay coined this oft-used and rarely-attributed phrase. I own this poem, printed and bound by itself, in what I have just discovered is a stated first edition. But, as Arlo Guthrie says, that's not what I came here to talk about. I'm here to talk about blog readership. I read an actual statistic about this once, but I have no idea where or what it was, so I'm going to make something up. Warning: statistics not actually to scale. Statistics are fanciful representations. To wit: in 2002 there were 5,000 blogs, of which perhaps 50 were mommy blogs with a side of culture. In 2007 there are 37 bazillion blogs, of which 3 bazillion are mommy blogs with a side of culture. I started mine in 2005. If I had started just a little earlier, people would have had a vastly greater mathematical chance of happening upon my blog. Once they happened upon, they might have looked around. They might have bookmarked me, even though I am not as funny as Dooce or Finslippy. They might have gotten in the habit of reading my blog. Now, even on the best traffic days of my life--the sideways refrigerator picture, last November courtesy of the Nablopomo randomizer, the day that Dawn actually dropped by to see my list of junk--I get ten or fifteen sets of eyeballs, and none of them ever comes back. I don't think it's because I'm so boring (although this post has clearly gone on way too long); I think it's because they already have enough blogs to read. I certainly do. "What kind of hat does Holly Golightly wear?" "First Communion Trunk Show Miami""Gotta Run For Shelter"
My 20th high school reunion has been scheduled for August of next year. [Do the math on that one! I guess the readers of my profile will no longer believe that I am 251 years old.] I hereby declare the start of one year of sickening nostalgia. I meant to begin with an image gallery of some objects that I particularly remember from the 80s, but was almost immediately stymied. The best part? I shared these shoes with my friend M. We pooled our money to purchase them at the sidewalk sales, where I must admit there were many many pairs available, due to the limited appeal of gold lame athletic shoes. 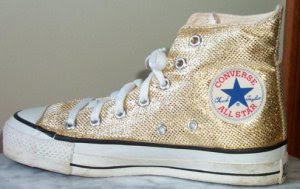 I like to think we split the cost not only because teenagers have very little money (M.'s parents and mine were exceptionally generous, but not especially wealthy), but also because we sensed that it was excessive to own an entire pair of gold lame sneakers. So, I thought to myself, what's the next totemic fashion item that springs to mind? Aha! My "Who Cares What Frankie Say?" t-shirt. I am both sad and happy to report that while the Internet is bursting with images of the "Frankie Say Relax" t-shirt, nary an image of its sarcastic sartorial retort is to be found. Sad? Because it brought my image gallery to a screeching halt. Happy? Because I am telling myself that the scarcity of the image means my shirt was just as clever and subversive as I thought it was 23 years ago. Here I am, mere hours after Labor Day ended, and full of fascinating stuff to post. Actually I can't think of much. The bloom is really off the blogging rose. It's not like the heady days of 2006, 129 total posts for the year. Almost a year ago, I was reading the memoirs of a tradition-loving, brilliant and homosexual Englishman; and now I am again, this time Moab Is My Washpot by Stephen Fry. I haven't gotten very far into it, but already there is a line I love almost as much as Bennett's line about family secrets. Fry's most vivid memory of his day-school experience is an incident in which his courage failed and then he proceeded to lie extensively about it; but to his surprise his teacher has no recollection of it, but instead mentions a charming--but in a way no less humiliating--moment that Fry had completely forgotten. "In John Kett's past the sun shines and birds sing, in mine there are banks of black thundercloud eternally forming over my head." I sometimes feel this way.